Orange County homeowners looking to add solar power to their homes have an opportunity to do so at a discount through a new solar co-op program. The initiative is spearheaded by Orange County Government, the League of Women Voters of Florida and Florida Solar United Neighborhoods (FL SUN), which is a local nonprofit working to organize solar co-ops across the state. Joining the co-op does not obligate members to purchase panels. 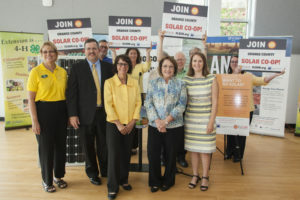 After the co-op receives bids from solar installers in the area, members will select one or two companies to perform the installations at a group discount. The exact price of a PV (photovoltaic) system is dependent on homeowners’ preference in system size and their home’s energy consumption. Additionally, there is a federal tax credit of 30 percent towards installation costs. Homeowners have the option to install the size PV system that fits their budget. In addition to promoting the solar co-op to residents, Orange County is encouraging its more than 7,500 employees to consider signing up. East Orlando resident Jon Weiss, director of Orange County’s Community, Environmental and Development Services department, is one employee who already participated in a solar co-op and had solar installed in May of this year.